This has been talked about for a while but as we've never had a GM/DM prepared to actually do it, it's never actually happened. So instead of waiting for someone else to volunteer (which given that no one has done so, in over a year, probably wasn't going to happen anyway). I'm going to step up and give it a go. The sessions will be once a week or fortnight depending on what's more agreeable and session length minimum of an hour, maximum of 2 with the idea to try and rap it up at the hour mark. 1) What evening's you are free? 2) What RPG's you'd want to play, (DnD, GoT, Star Wars, BSG, what ever you can find out there)? 3) Are there any that you DON'T want to play? 4) Would you like pre-built campaigns or homebrew? 5) Would you like it once a fortnight or once a week? 6) What sort of time per session would you prefer (min and max lengths please)? 7) Strict rules or House rules? 8) Starting at level 1 or a couple of levels higher? This will be my first time running anything like this so there will be a fair few bumps along the way and once / IF people sign up it will take me a couple of weeks (3-4 I think!) to plan everything out. If I am involved, i'll more than likely record it as come on, it's DL playing a fantasy game, trying to sort of be in character - it's going to involve drinking, bad language, rage, love and laughter and that's just from Locke! I was going to say no but then found out there was a mylittlepony one.... so yeah, no that! As i've little experience, pre-built is fine for me and best for Locke at first, Homebrew can come in over time. I've been brought up raiding so am happy for it to go on for a few hours (with breaks!) - Agree with Hal, prep work outside of the timeslot, intro's and playing inside. Level 1 - would like it to be a fresh start as it'll be one of my first proper times. 1.) I'm a student so, most. 2.) Prefer fantasy but I will play most anything, got experience in DnD, Dungeon World, Victoriana, and WHFRP. 6.) A few hours, no less than around 2. 1.) I'm employed, so Fridays/Weekends work best. :) But I can normally do Tuesdays/Wednesdays if needed. 3.) My Little Pony RPG? 4.) Homebrew would be fun, but very time consuming for GM. So wouldn't mind Pre-built if GM needs time to work on things. 5,) Weekly would be best, but fortnightly doesn't fuss me too much. 6.) 2-3 hours normally works best, too long and peoples attention starts to flag & I'd suggest doing things that amount to paperwork on the forums inbetween sessions, so as to not cut into session time. 8.) A story always starts from the beginning! You quite clearly do not have much experience with the internet. 3) Are there any that you DON'T want to play? What's wrong with My Little Pony? 4) Would you like pre-built campaigns or homebrew? Homebrew, but only because it's more work for Locke... Unless he pre-builds. Then that. 5) Would you like it once a fortnight or once a week? Why not twice a week? Hmm? 6) What sort of time per session would you prefer (min and max lengths please)? You're gonna need to set aside 3 hours mesa tink. 7) Strict rules or House rules? Strict rules. That are broken. 8) Starting at level 1 or a couple of levels higher? Depends on what we're playing. Not much point starting at lv 1 if we all dragons. No levelling for 7 levels? 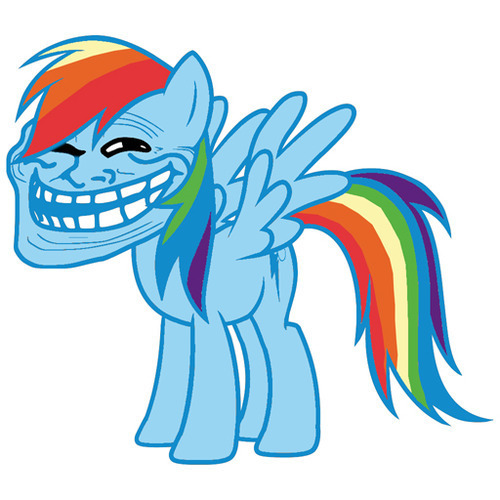 I love how a my little pony troll picture is so toxic that it stops the thread dead. Come on folks, Locke is trying to set something up for the community to enjoy! My little pony in general is a toxin that knows no equal. Grip - you havne't put your name forwards.... Pony up! I prefer more of the action-oriented RPGs rather than the more freeform/intrigue kind of RPGs. I think the closer together the better. You don't want me, i can in no way at any point take it seriously enough such that i wouldn't ruin the efforts or enjoyment of others. *I* would likely have a great deal of fun, I'm not sure a GM who puts a great deal of work into this would ever either thank me or invite me back.